Fresh herbs feature prominently in Vietnamese cooking. Almost every meal is accompanied by bountiful herbs which are torn, tossed or rolled into soups, noodle dishes, sandwiches or more. Tra Que, a charming village just outside of Hoi An is famous throughout the country for its vegetables and herbs. 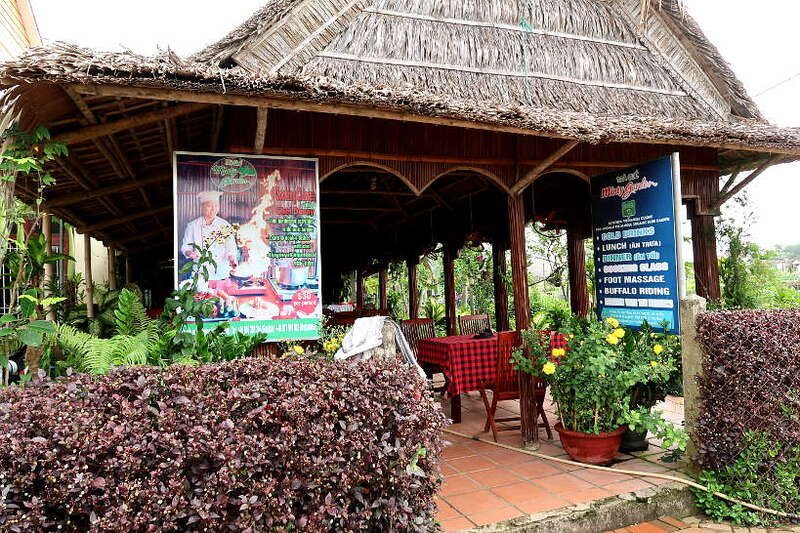 This Hoi An cooking class combined a farming tour and a cooking class at Tra Que Minty Garden. This was the perfect place to get an understanding of the fragrant herbs that are essential to Vietnamese food. The cuisine of Vietnam beguiles and charms, join us on a fascinating farming tour and cooking class at Tra Que Minty Garden. 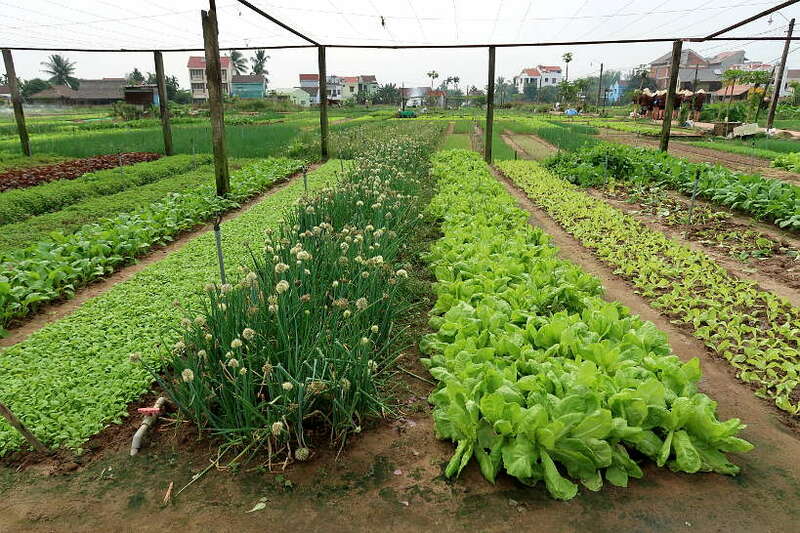 Located about 3 km north of the Old City of Hoi An is Tra Que Village, an organic vegetable village. The area is surrounded by the De Vong River and the Tra Que Lagoon. It was established about 300 years ago and is known throughout the country for having nutritionally rich and aromatic herbs. What makes the Vietnamese herbs and vegetables from Tra Que village so special, is that they are grown without the use of toxins or chemicals. Instead, seaweed or algae from the De Vong River is used as manure. In addition, the rich soils and unique farming land have contributed to producing aromatic herbs used in traditional dishes. Each family, in Tra Que village, we learned, has a plot of 500 sq meters to grow herbs and vegetables. The herbs and vegetables are used locally in Hoi An and some are sold to Da Nang families who drive up on the weekends to buy their week’s supply of Tra Que vegetables. 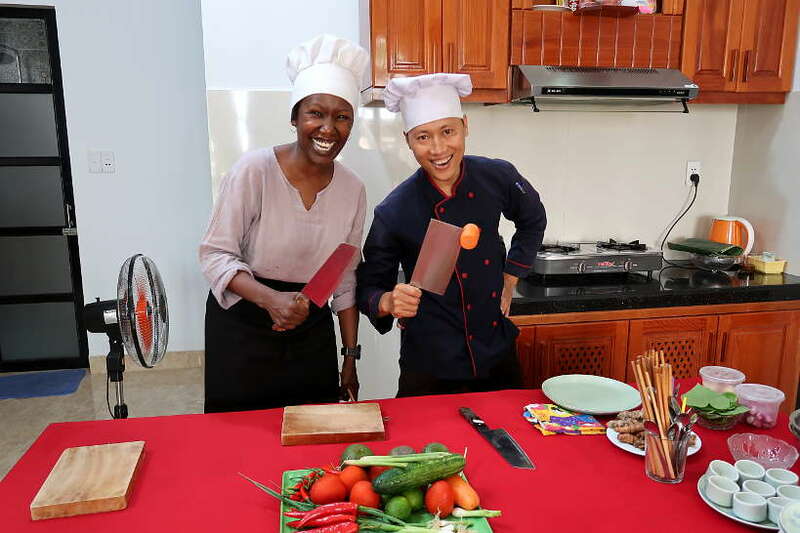 The Hoi An cooking class began with a warm welcome from chef Danny and his wife Lan. We arrived for the 9:00 am morning class from Da Nang, with private transportation arranged by Tra Que Minty Garden cooking school. For large groups, the cooking class takes place at the Minty Garden restaurant. Whereas for smaller groups, like our private class for two, are held in the intimate home kitchen of chef Danny and his wife. The Hoi An cooking class started with a Tra Que village farming experience and was followed by learning how to cook the local specialties. Before the cooking class, we walked to the nearby farm to learn about the herbs and the age-old farming techniques used for decades in Tra Que village. Tra Que village is often referred to as the ‘vegetable village’, although Chef Danny told us that it is mostly herbs that are grown in the village. You will find Vietnamese herbs like mint, lemongrass, Vietnamese basil, betel leaf, spinach, red spinach, morning glory, saw-leaf herbs and much more. 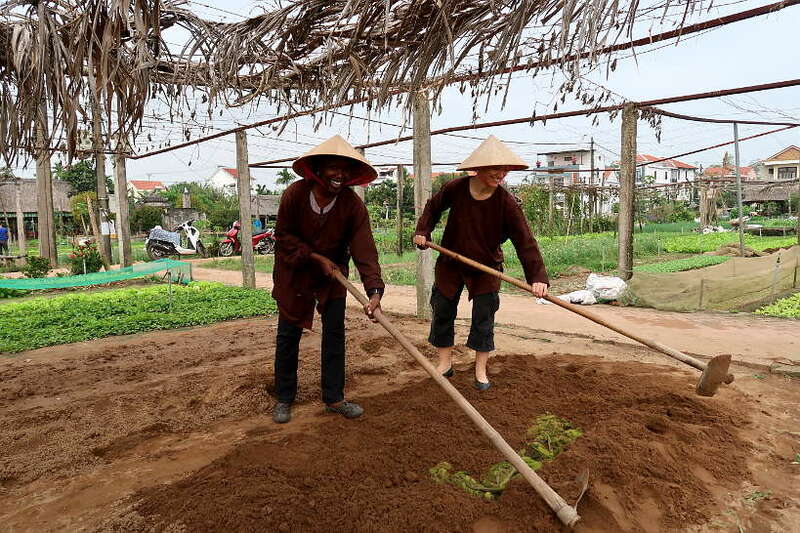 In preparation for the farming experience, we got dressed and wore a traditional Vietnamese conical hat known to provide high protection from the sun and the rain. After grabbing a hoe, we made our way to the garden plot reserved for our farming practice. With the help of a local farmer and chef Danny, we began by digging. Our first task was to dig a rectangular hole of about 10cm or 5 inches deep and 3 square meters in preparation for planting. 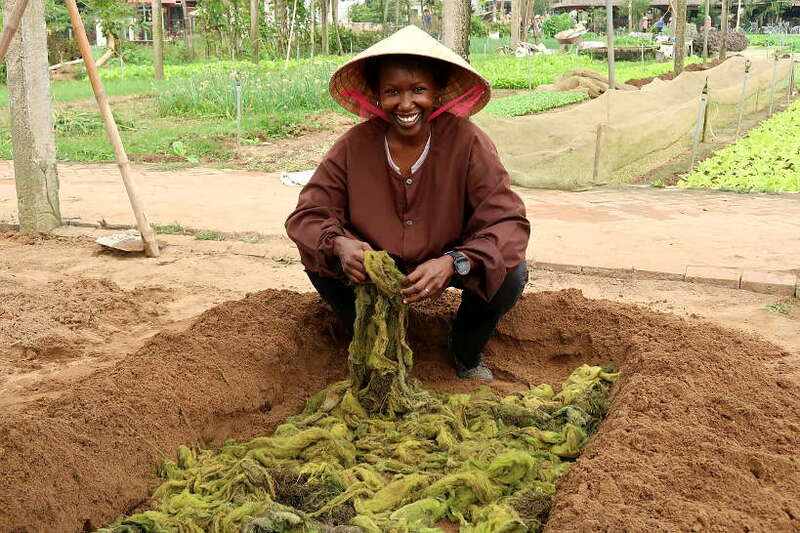 Once we leveled the soil, we picked the seaweed that had been foraged from the Coco River, also known as Hoi An River, to lay on the ground before planting. Seaweed is used as a natural fertilizer to nourish the soil. There are no chemicals added and no GMO seeds used. Farming in Tra Que village is all organic farming. As chef Danny told us, the people of Tra Que have been planting herbs and vegetables with seaweed as the natural fertilizer for more than 300 years. This is “ a way to recycle nature’s resources.” he remarked. After burying the seaweed in the soil, we made sure the ground was even using a rake to do so. Chef Danny and the local farmer helped us along the way by showing us to move the soil in the right position and direction. Every move was very precise and seemed like a work of art. There was particular attention paid to the shape of the soil and use of symmetry guided the process. Once the soil was ready, we planted Vietnamese spinach uniformly in the earth. Our final task was to water our beautifully planted plot of spinach. The farmer showed us how to lift and fill the two large metallic gardening cans with water. The two large water pots are hooked to a wooden board and carried on the back and shoulders. Although he showed us with ease how to lift and carry the two large watering cans, it was actually quite heavy and difficult to maneuver in reality. After the farming introduction in Tra Que Village, we picked up a few herbs and vegetables on our way back to the cooking school. Red spinach, radish, and lemongrass were some of the herbs we brought back to Tra Que Minty Garden. A refreshing drink was awaiting, perfect to sip on after our morning farming exercise. The Tra Que Cocktail, as Chef Denny named it, is made with Thai basil, lemongrass and other natural goodness. 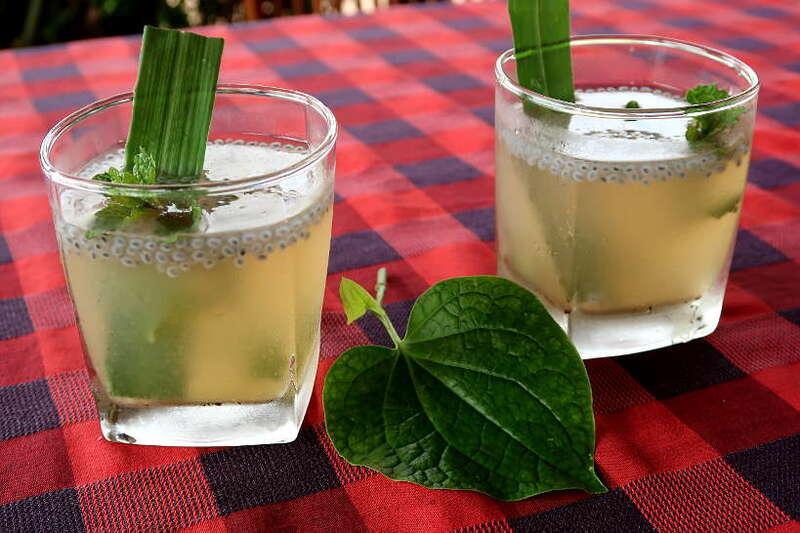 Not sweet, this refreshing drink was perfect to quench our thirst before starting our Hoi An cooking class. For our Hoi An cooking class with chef Danny, we learned how to make four local dishes, using local herbs and vegetables from Tra Que Village. While we were familiar with some of the dishes, we had never cooked them before. The only dish we did not make was the Banh Flan (crème caramel) for dessert, which had been prepared in advance. Starting out with the dish that would take the longest time to prepare, we chopped up the necessary ingredients for the grilled fish in banana leaves, which was red snapper fish. We started out by chopping garlic, shallots, spring onions, red peppers, and turmeric into very thin and small pieces. Seeing our knife skills, chef Danny taught us how to use the large knives effectively to safely chop the vegetables. After chopping the vegetables, we then made a little sauce for the fish. We mixed together a little fish sauce, soy sauce and oyster sauce, which we then seasoned with salt and pepper. Once we spread this mixture on the red snapper fillets, we topped the fish with the chopped vegetables and then wrapped them in banana leaves, in preparation for grilling. Chef Danny is a very entertaining and knife loving chef. With amazing knife skills and an entertaining demeanor, we had a lot of fun watching him chop up the beef for the bo la lot. Bo la lot is a popular Vietnamese starter. 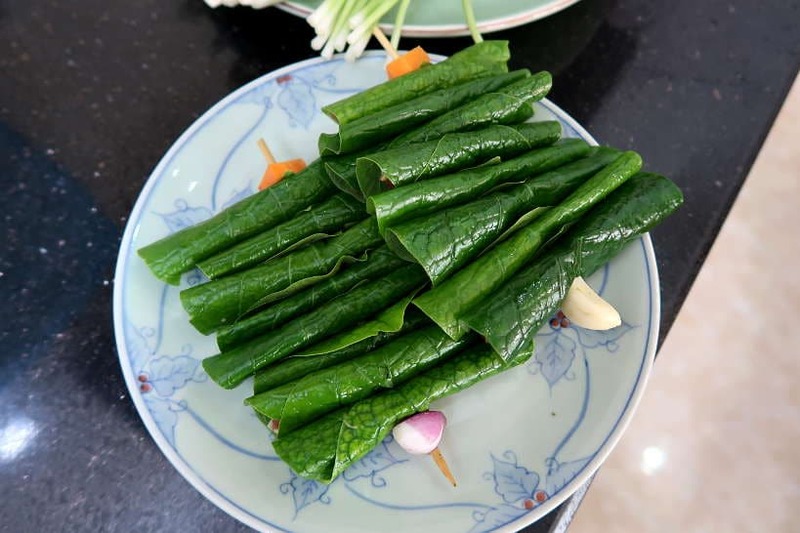 It is made by wrapping a small amount of beef in a wild betel leaf from Tra Que vegetable village and then grilling it. We started out by slicing the beef and then chopping it up to a minced version in chef Danny’s entertaining manner. To the beef, we mixed in a little cooking oil, chili oil, as well as chopped garlic and shallots. After mixing everything together, we learned how to stuff the betel leaves. On a single betel leaf, you placed a little bit of beef on one end and then gently rolled it and punch it into a skewer. We made several of these beef bo la lot and got them ready for grilling on the barbecue. These little Vietnamese appetizers were fun to make and packed with fresh flavorful herbs from Tra Que village. A local Hoi An specialty, the “three friends” are made with organic prawns, thinly cut slices of pork, herbs and then rolled together with fresh spring onions. First, we cooked prawns and pork separately. Next, we took one prawn, one slice of pork, added a little bit of mint and coriander. Then we tied it together with a strand of fresh spring onions that we had picked up earlier, while farming. Tam Huu represents harmony and friendship. 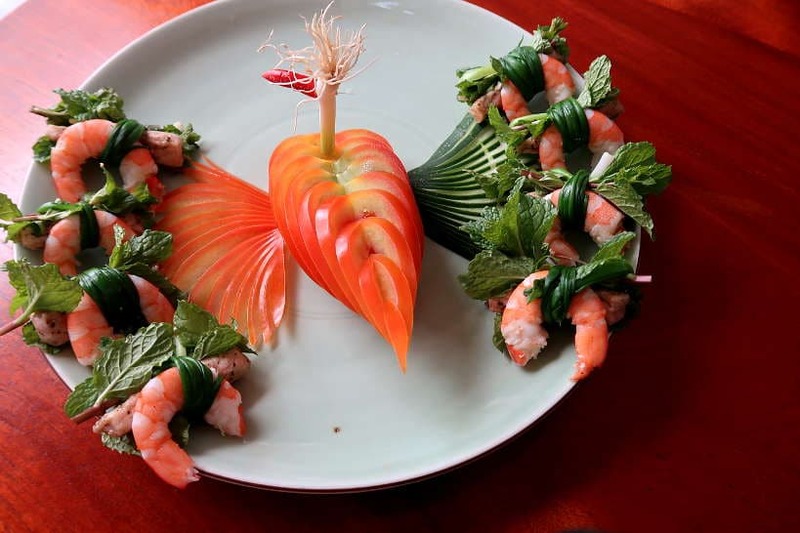 The three friends – prawns, pork and herbs – attached with spring onions, are exquisite in taste and presentation. When dipped in an accompanying sweet and sour fish sauce, the wonderful flavors are enhanced. 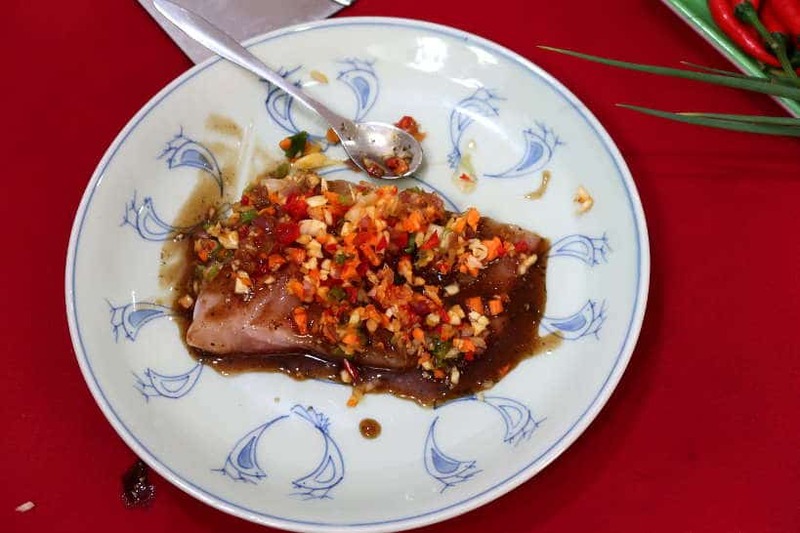 Easy to make, this was one of our favorite local specialties in the Hoi An cooking class. Banh Xeo or sizzling pancakes is one of our favorite Vietnamese food. Part of what attracted us to this particular cooking class Hoi An was the opportunity to learn how to make this incredibly delicious Vietnamese pancake. After preparing the dough and cooking the chicken and pork, chef Danny had us each step up to the hot pan to put all the ingredients and make the savory pancake. In Hoi An and Central Vietnam, the banh xeo are different from the ones you find in the South of Vietnam. They are smaller in size and usually stuffed with shrimp, pork and egg. Whereas, in Ho Chi Minh City, the banh xeo are large in size and have various toppings, including, chicken, mushrooms and more. The most unexpected experience was cooking the banh xeo in the pan. Once we put the batter and ingredients and the extremely hot pan, hot flames shot up from the pan and initially scared us. Fortunately, chef Danny guided us skillfully, until the flames subsided and the banh xeo, cooked to perfection. Crème caramel or banh flan, a popular dessert in Vietnam was introduced by the French. Although we did not make this dessert in the Hoi An cooking class, we enjoyed the silky and rich textures. Lan, chef Danny’s wife had made the dessert the night before so that it could refrigerate appropriately. 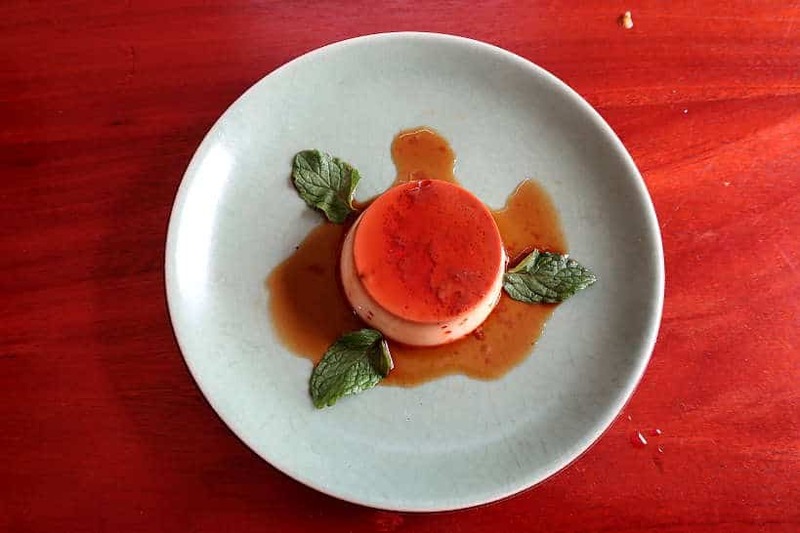 This dessert is also known as bánh caramel or kem flan in different parts of the country. We enjoyed the simple flan which was smooth and not sweet. Around the country, you’ll find other variations that include coconut flan and others with black coffee poured on top. The Hoi An cooking class was a fun and entertaining experience. Starting out with learning about Vietnamese herbs in Tra Que village, gave us a deeper appreciation for the unique flavors in Vietnamese cuisine. Chef Danny is a wonderful instructor who not only teaches you about the cuisine, he also entertains you in the process. Watching him skillfully maneuver his knives was quite enthralling. We picked up a few knife skills along the way, but we still have a long way to go before we get to his level. Following the cooking class experience, we enjoyed the meal we had made sitting in the comfortable dining room. The food was incredibly tasty and very flavorful with the fresh herbs from Tra Que village. The beef bo la lot was our favorite and the tam huu was wonderfully simple appetizer we will be sure to recreate. To wash down the meal, Claire enjoyed a unique Vietnamese rice beer. Taking a cooking class on your travels is a great way to better appreciate the local specialties. From taking cooking classes in Luang Prabang the culinary capital of Laos, Chiang Mai in northern Thailand and Phnom Phen, the capital of Cambodia, we’ve always had a fun and enriching experience. 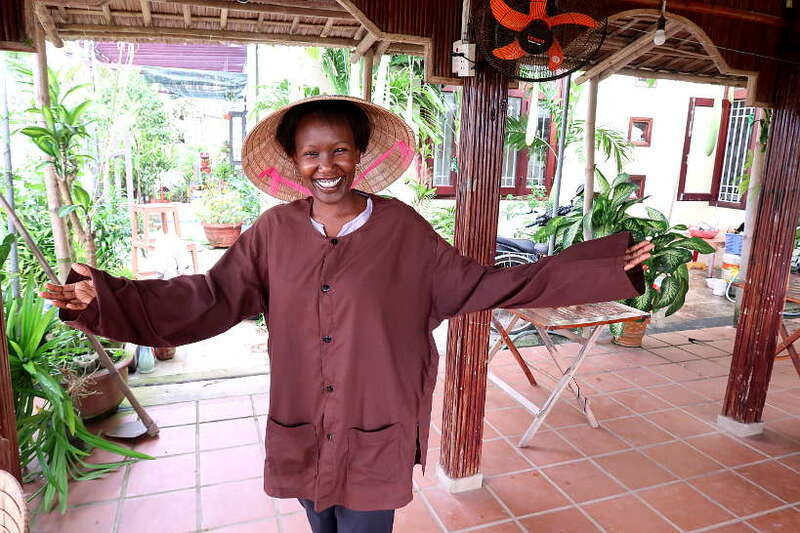 If your travels take you to Hoi An, we highly recommend a farming tour and cooking class at Tra Que Minty Garden. Gain a deeper appreciation of the fresh herbs from Tra Que village and entertaining cooking experience with chef Danny. Location: Tra Que village is conveniently located 3 km (less than 2 miles) from the old city of Hoi An. Pick up and drop off is available from Tra Que Minty Garden, please book in advance. Two classes are offered daily. The morning class begins at 9:00 am and the afternoon class starts at 3:00 pm. Each class offers a farming and gardening experience in Tra Que village. Menu: The menu for the morning and afternoon cooking classes are different, but they both include local Vietnamese specialties. A vegetarian menu is also provided. Special thanks to Cookly and the Farming Tour and Cooking Class at Tra Que Minty Garden for having us on this authentic Vietnamese cooking class. All views and opinions expressed are our own. Full bellies and happy taste buds too. This would be an exciting experience, that’s for sure! I would love a cooking class since I am pretty terrible in the kitchen. This food sounds delicious! The cooking class was so much fun. Working with chef Danny will make anyone a Vietnamese chef. Hope your travels take you to Hoi An so that you can experience the class for yourself. Cheers, Amber. As a big gardener I am always reading and learning how others grow their food. Glad you added this section to your post. It looks like you had an absolute blast! I think it would be fun to do something like this. 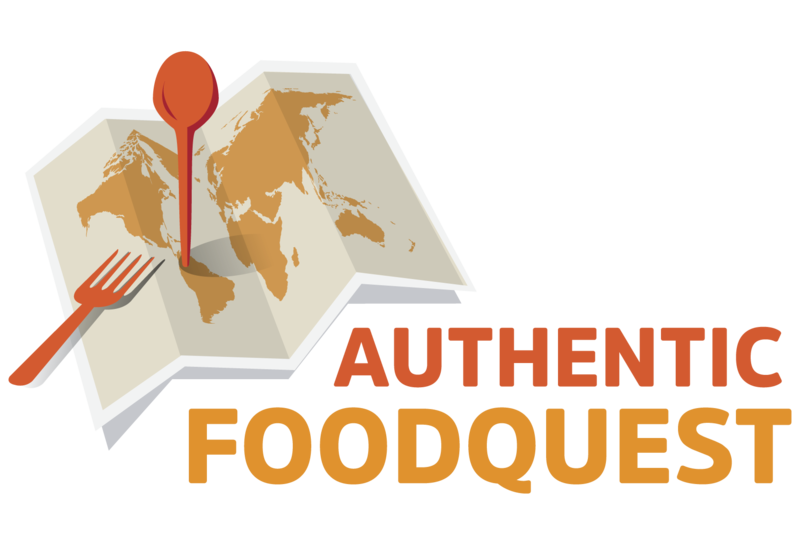 I love international foods and I love exploring the different flavors of different parts of the world. That’s great to hear Jeannette. Have you taken cooking classes before? You really got the whole Vietnamese experience from garden to table and drinks. I have never been there but this looks like a great trip. This was truly a fantastic local farm to cooking class table experience. We definitively recommend it if your travels take you to Hoi An. Cheers. How AWESOME! I have been to Hoi An before but we did NOT do a cooking class there. We actually did one in Hanoi! I kind of wish we did one in Hoi An now too! haha! Guess I just have to go back! You are right, Gigi, a trip back to Vietnam is always a good idea. This looks like such a fun experience. The food really looks amazing. I love how it’s plated. What an amazing sounding experience it seems like you really got to experience things the authentic way and it looks like the outcome was absolutely delicious too! A truly exceptional experience and a class we would highly recommend if your travels take you to Hoi An. Thanks, Sarah. What an amazing experience! Now this is something our family would love, love, love to do – we’re total foodies so we’d totally be up for it. Perfect Lisa, chef Danny can tailor his classes to children, so it is an experience that can be enjoyed by all. Thanks for stopping by. This is definitely a unique experience. 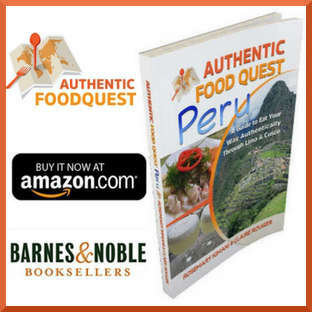 Immersing yourself with the culture and cuisine while learning how to cook is so memorable! Thanks, Roch. A great and fun experience, and one we would recommend. This would be so fun to experience! I am all for trying new foods and exploring different cultures. I love the idea of seeing how the local food is grown, it really connects even more to the people in the area. We are 100% in agreement. When you see how the local food is grown, you appreciate the food and experience at a deeper level. Have you taken a cooking class before? I haven’t heard of seaweed as a fertilizer and that was interesting to me. Love the post! Glad you enjoyed the article, Terri. All of these ingredients look so amazing since they are sourced locally!! I’ve always wanted to take a cooking class. This one looks like one I’d really enjoy! Looks like you guys have fun. I love to enjoy good food in each country like this cooking class. Vietnamese cuisine is not familiar one but sounds delicious sure I would like to check it out. This was truly a fun cooking experience. If you are not familiar with Vietnamese cuisine, we highly recommend checking out a Vietnamese restaurant in your local area. You will be surprised by the amazing and flavorful dishes. Thanks, Swathi. I love the garden and all the different vegetables and options and that it’s all organic and you used that to cook! Amazing! That herb garden is beautiful! I love fresh grown products! I really do love how the Tam Huu was plated! Thanks, Amy, making the Tam Huu was fun and the plating, led by chef Danny made it even more special. So glad you enjoyed the article. I have never been here and I would definitely want to try this out as well when I finally visit Hoi An. Such a memorable experience for you. 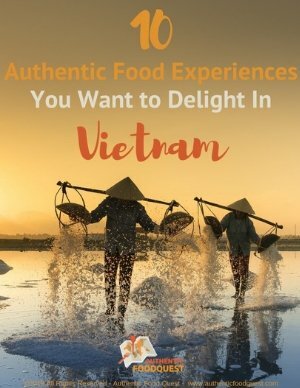 That looks and sounds like a wonderful experience, given that Vietnamese cuisine is one of the world’s greats. It’s all in the herbs and Tra Que Village must have been so educational. Plus those dishes you made are not the run of the mill phos! Lol…you are right, the dishes are central Vietnam or Hoi An specialties:) A real treat. Great experience and one we would recommend if your travels take you to Hoi An. Cheers. We were just as surprised Sherianne to learn about the benefits of seaweed in the farming process. The end result are truly fragrant herbs and vegetables. Cheers. I’ve never tried Vietnamese food, but I’m sure it’s delicious. Fresh herbs have always been a key ingredient in cooking, so I am not surprised to hear it’s used abundantly in the Vietnamese food as well. I’d love to try one of those Tra Que cocktails sometimes. If you have a Vietnamese restaurant in your Anda, highly recommend trying it out. You will be delighted by the aromatic cuisine. Cheers. What a wonderful experience you had. The food looks so delicious and the presentation is so beautiful. It was very interesting to read about the different things that they do in their culture verse the American way. Thanks, Traci. Glad you enjoyed the article. 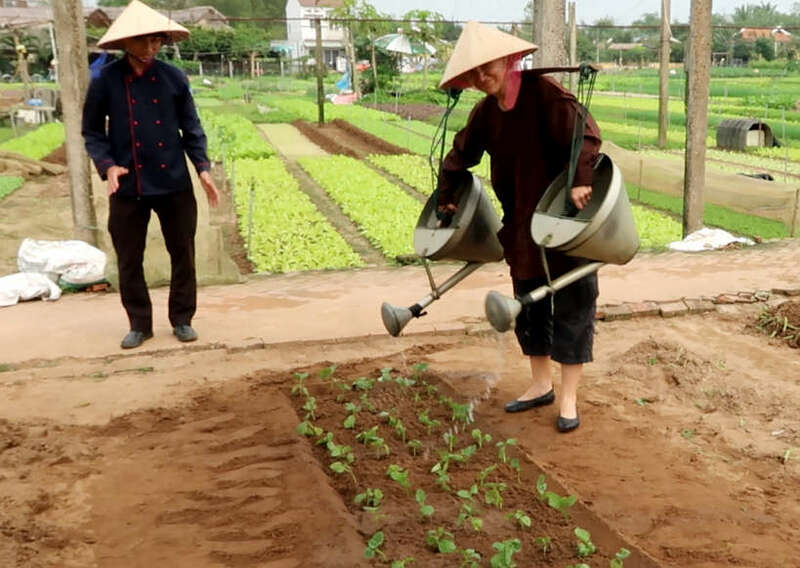 Ladies, you look right at home in traditional Vietnamese farming outfit. I love Vietnamese food, but never thought of going to cooking lesson even when I was there a a couple of years ago. I like the fact that this Hoi An cooking class combined a farming tour and a cooking class at Tra Que Minty Garden. I think it’s amazing that they’ve been using seaweed as fertilizer for more than 300 years! It is indeed a great way to recycle nature’s resources. The “three friends” dish looks so yummy and healthy, especially with all that leafy herbs. Thanks Fairuz, so glad you enjoyed the article. That’s a bummer that you didn’t take a cooking class while in Vietnam. Something to consider on your next trip. Thanks for stopping by. I’ve had very little experience with cooking classes, and especially one this comprehensive. I’m impressed with the culinary experience offered you, from a farm tour to planting your own garden plot to learning how to prepare several recipes. I’ll bet this was a highlight of your visit. This was a great time, Tami. On your travels, do take a cooking class for a unique experience. You’ll have fun and learn so much. Cheers. loved this post! I miss Vietnam for the people and the food. Thanks for the memories. So glad this article brought back such positive memories. Hope your travels take you back again soon. Cheers, Trent. I think it is a great idea to take a Hoi An cooking class to learn more about Vietnamese cuisine. Great that the Tea Que village has made a commitment to producing produce without toxins and chemicals. Certainly will give you a much better taste. So good that they put you to work before your cooking lesson! Your menu certainly sounded tasty. And interesting to learn that prawns, pork and herbs are referred to as the “three friends”. Looks like a lot of fun. Thanks, Linda. Indeed the class was so much fun and truly a great way to understand more about Vietnamese cuisine. The “three friends” is a must!! Cheers. 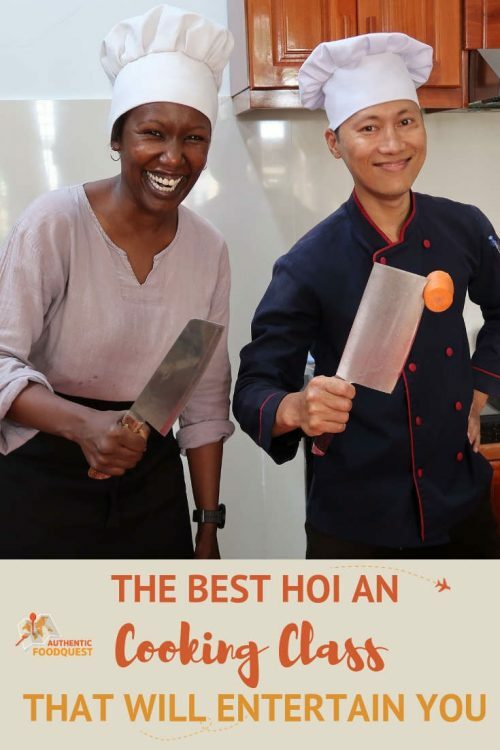 Wow, there are so many cooking classes in Hoi An! I did one a few years ago and learnt to make Vietnamese spring rolls. It got me hooked on those fresh healthy spring rolls since. I’ll definitely check out some of these next time I visit. That’s great to hear Christina. A cooking class in Hoi An is so enjoyable. Always great to go back and take another. Cheers. I love taking cooking classes when I’m traveling, its such a great way to discover new flavors! This one looks really fun! The class was loads of fun and a way to go deeper into the local culture. Truth be told I think cooking is for those who do it with passion. I’m not the best in the kitchen. Looks like you had a lot of fun. Friends of ours are in Vietnam and did a cooking class in Hoi An too!! I hope they did this one, it looks phenomenal. I love all of the fresh herbs and ingredients in Vietnamese cooking, it makes for some of the most delicious food. You both certainly worked hard for all of dinner, with the farming and food prep. Chef Danny looks like a hoot, and an excellent chef. Shall remember this for a future visit. Can’t wait to hear what your friends thought of their experience. I’m sure they had a great time. 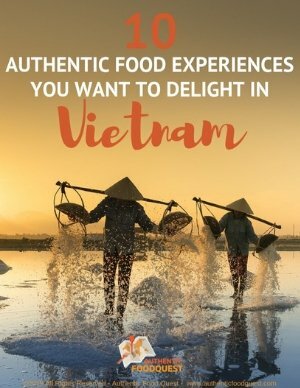 Do keep this article handy for your next Vietnamese trip. This is such a great experience. I did a cooking class in Hoi An as well. We made spring rolls, mango salad, and a fish dish. Delicious. Awesome to hear Nicole. So, you know how much fun the experience can be. Have you taken cooking classes elsewhere? 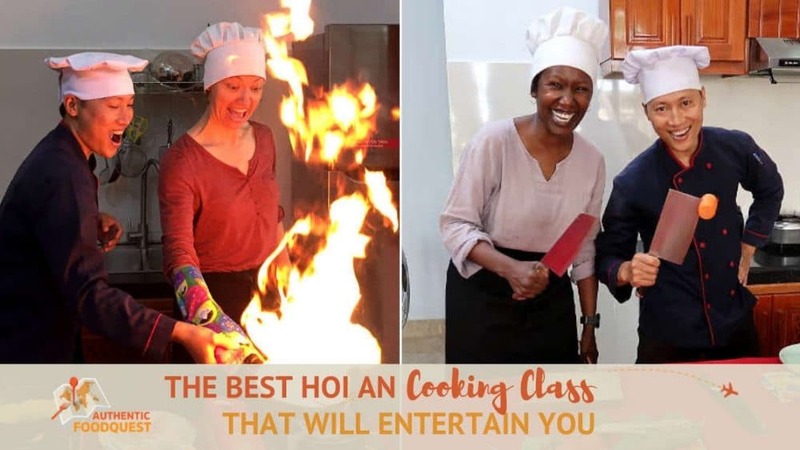 I love taking cooking classes when I travel and this one looks like so much fun. I love Vietnamese food but I have never tried cooking it. That cocktail sounds amazing too. 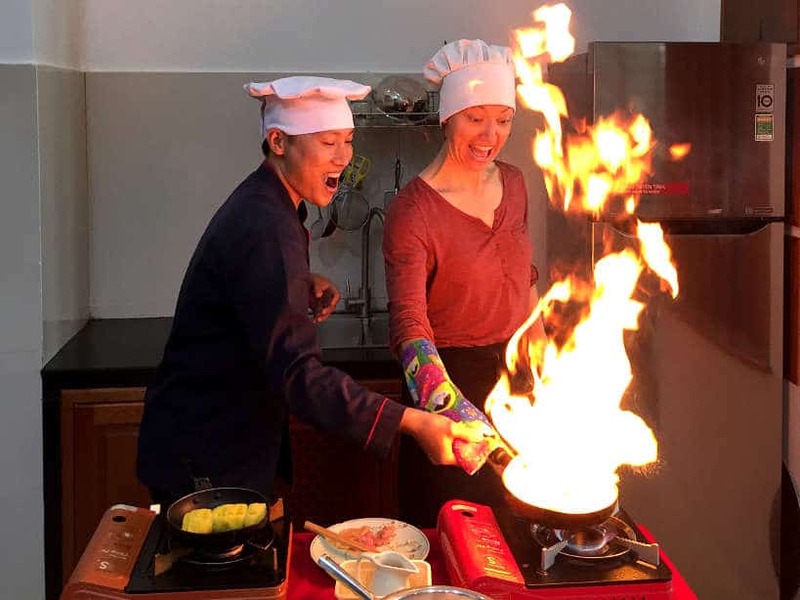 If you love cooking classes and Vietnamese cuisine, a cooking class should certainly be on your list. Great fun with chef Danny and an interesting way to learn about the local culture. What a wonderful experience you had. One of the main reasons I love Vietnamese food is because of all the fresh herbs that are in their cuisine. It’s so refreshing and delicious. I hope to have a similar experience like you some day! Thanks, Candy and so glad you enjoyed the article. Indeed, the fresh herbs make a difference to Vietnamese food and learning more about them makes a huge difference. Woah this is so cool! And you look like you’re having so much fun! I’ve never taken a cooking class abroad before (or actually ever), so that would be a fun thing to try in the future! You’ve got to try a cooking class, Sarah. Loads of fun and you learn so much as well. Take one at “home” first and see what you think. 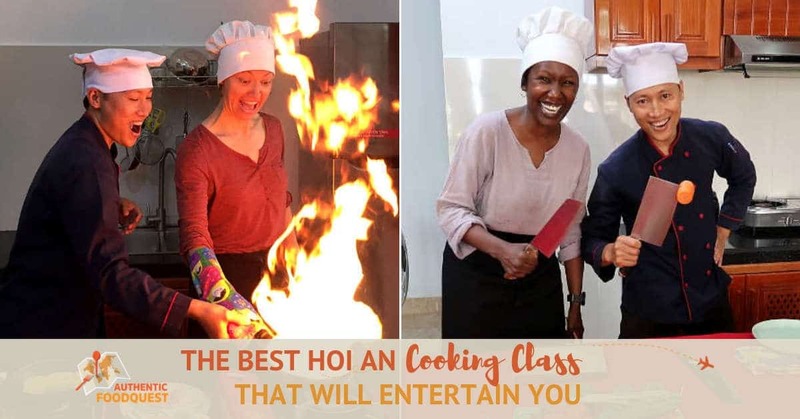 Wow I’ve never tried this type of experience before but the Hoi An cooking class definitely sounds fun! I think the sizzling savory pancake sounds delicious. On your next trip, take a cooking class, it is quite an experience 🙂 Thanks for stopping by. Woah! I would have definitely run in fear if the pan erupted into flames like that! Haha! It seems like you had a really great farm-to-table experience. I bet the flavours were out of this world! Lol..I was totally taken by surprise with the huge flames. Fortunately, I was safe with chef Danny. Great fun and awesome flavors 🙂 Cheers. We never got around to doing this when we were in Hoi An, which I really regret as I adore Vietnamese food. 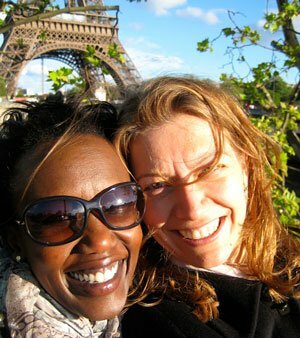 Its also a great way to interact with locals and learn more about their culture. Next time for sure. Like you said, Aimee. There is always next time 🙂 Truly a great way to connect with the locals. Thanks for stopping by. Such a neat experience! And those dishes are gorgeous! I love that the cooking class starts with time in the garden. It’s so important to be connected to our food, and of course, it’s much easier to feel connected when you come across ethical farming. I’ll absolutely try out this cooking experience if we ever make it to South East Asia (someday!). This cooking class looks amazing! I love Vietnamese food in general, and talk of all those herbs and vegetables got my mouth watering! It sounds like a great class in Hoi Anh, will definitely consider it if I ever return. 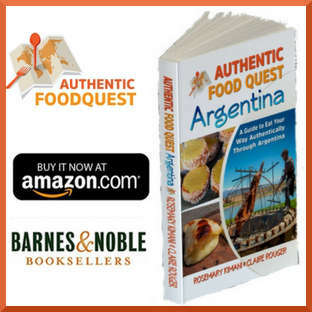 It makes a huge difference to learn about a cuisine you love. The Vietnamese class with chef Danny is certainly worth the experience if you find yourself in Hoi An. thanks for stopping by, Lisa. 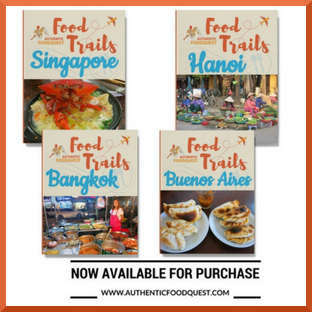 I’m hoping to go to SE Asia in 2020, and taking a cooking class somewhere in the region is definitely on my list. I love that this one started with planting and cocktails! Keep this article handy Dylan for your trip to SEA. You’ll really have fun with chef Danny. Thanks for stopping by. Cooking classes are such a great way to discover the cuisine of a country, plus you get to eat all the yummy foods after! Those cooking classes all sounds like a lot of fun! Thanks Lyne. The class was great fun and a great way to discover the local cuisine. Appreciate you stopping by. My husband and I really love cooking! However, living in a van just hinders us from going all out sometimes! 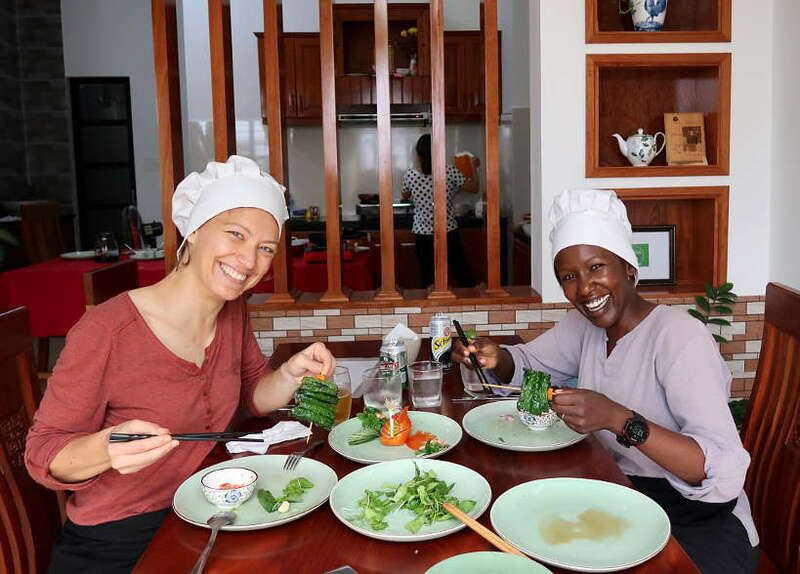 This cooking class might be a great experience for us both given that Vietnam cooking requires just a few ingredients at a time that makes it perfect for a life on the road! Taking a cooking class is a great way to get your “cooking mojo” back on when living in a van. At your next destination, give it a shot!! Safe travels.